I am finally moved into my new house after years of construction (its still not done and we’re at more than 2 and a half years since breaking ground) and even more years of planning, and hopefully soon I can get back into my garden more frequently now. Being without a proper garden all this time has been hard on me. I had then put up this garden I think 2 years ago now, but not living up at our build site I couldn’t really deal with it. So I mostly grew weeds, and some tomatoes, and some other things, but mostly weeds. This year was worst than last year. Last year I actually managed to come up more and do some weeding, and there was also a drought. This year there was plentiful rain and I had less opportunity to come up and deal with weeds. I settled for simply putting plastic straight over some large sections of the garden to kill the weeds but they just grew out of control in other sections or too big for the plastic treatment (my garden is 5000 sq/ft, it is a lot to handle 15 minutes at a time). The weeds grew taller than me because of all the rain, and most regretfully they were able to go to seed before I could do anything like kill them or till them under. I hate it when this happens, allowing a weed to go to seed is a cardinal sin of gardening. I fear next year I will have it even worse. Right now my plan for next year is to landscape fabric the whole entire thing, and poke holes for planting. That is the only thing I think will truly allow me to get a handle on my weed situation. 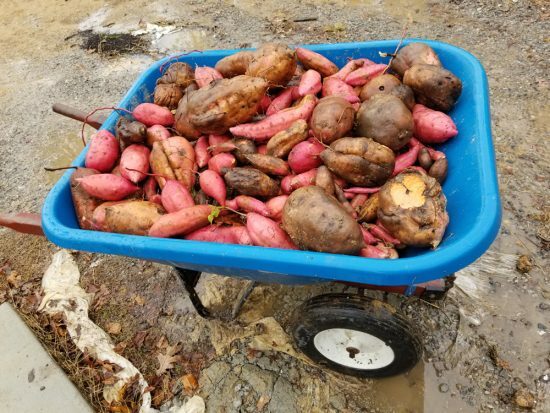 The only thing that truly grew well for me was sweet potatoes. I planted I think 25 sweet potato slips. 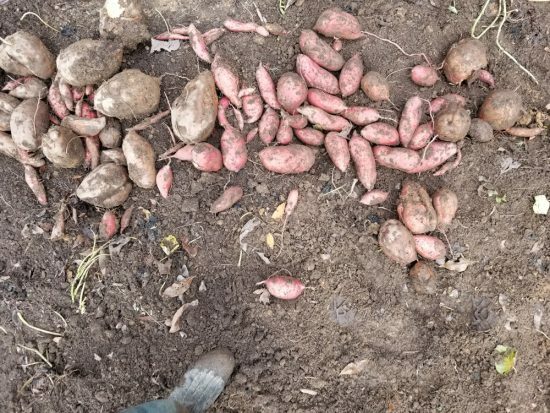 I had tilled the section and then immediately planted the sweet potatoes and thanks to the regular rains and hot humid weather they were able to grow enough to shade out most weeds in that area. I still got some tomatoes, not as much as last year, and some peppers, some beans, and the kale is out there still growing strong enjoying the colder weather, but I got so, many, sweet, potatoes. This was my first time successfully growing them, I had tried a few times in the past without much luck (but often in Michigan where they aren’t well suited, here now in Tennessee it is a different story). I got I think 300 pounds of them. I completed filled a large two wheeled wheelbarrow and, despite being quite a strong man, could barely move it. They have been curing a week and a half in my greenhouse (it gets cooler at night but is otherwise the only room I have that can get up to 90+ during the day which is what sweet potatoes need I’m told). I’ve lost a few to rot, likely already rotting before harvest. I’m also sure I missed some still out in the dirt. They are supposed to cure for 2 weeks then go somewhere into long term storage (still dry and relatively warm), so I haven’t tried any yet. But sweet potato casserole is calling come Thanksgiving. So once the curing is done my family could eat a pound a day and have them last nearly a year. I never really felt like I could truly feed my family off my land until now. But now I think that my garden is capable of providing enough food for that (plus all of my fruit trees and whatnot) and add in hunting in our forest I think we could really live off the land. Not that we need to in our modern society, but there is something primally rewarding about the notion that it could be done. In furtherance of that belief I am trying to maintain my sweet potatoes. One tuber I dug up still had small plants attached to it, so this one is already potted up in my greenhouse. 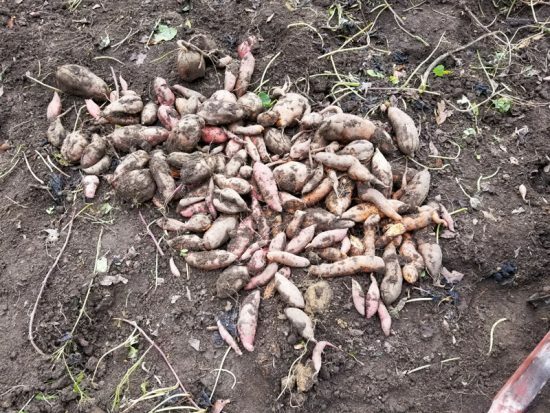 There were also many small potatoes I found that won’t be great for eating but I have them half submerged in cups of water to generate more slips. If I can get slips off of these I will plant them (I also bought a 200 gallon fabric pot for my greenhouse for my winter sweet potato patch), and experiment with growing sweet potatoes year round. I don’t much want to be able to generate a large harvest here in my greenhouse, it would be nice but I’m realistic about it. 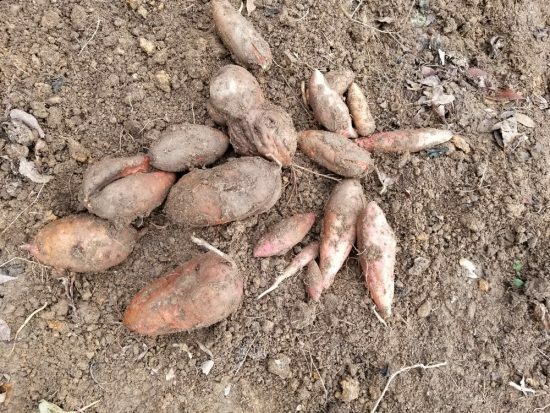 My main goal is to just make sure I have live sweet potato plant material come late spring so I don’t have to order slips or make my own off a store bought sweet potato. 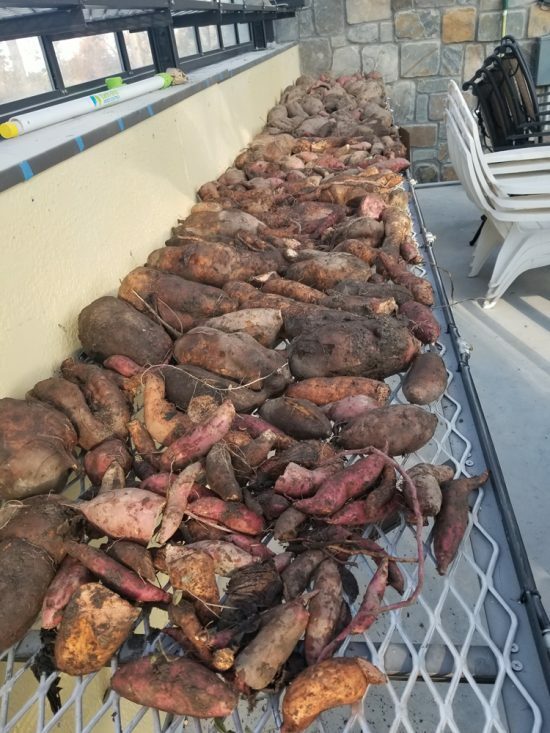 I want to have a greenhouse full of sweet potato vines I can divide and root and transplant out in the garden, not just little slips, but healthier larger vine segments, “super slips” if you will, to get a start on the next season and provide the missing link in true self sufficiency. I would like to thus prove to myself that if cut off from the rest of society I could continue to grow these perpetually with my setup. I will let you know how it goes. I also just learned that sweet potato greens are edible and nutritious, so I might nibble on those over the winter as well. My biggest concern, both with my curing and my overwintering, is the temperature swings in my greenhouse. It gets up to 95 or 100 degrees if the sun is shining, but at night it can drop to 60. It has a heater but the heater is not capable of keeping it very warm at night. Humidity is no problem. So I’m not sure if this is going to consistently provide the summer mimic temperatures for the potatoes to thrive or if it will be too cold at night. I’m also not sure what the swinging temperature will do to my curing process. This will be an experiment for sure. We were successful curing sweets in a small bathroom with a small heater. In a smaller room we could keep the temp and humidity constant for curing. Then they rested comfortably in a corner of the basement till spring. I was able to get good slips by starting with my own potatoes in March. And yes the leaves are great for cooking.